Hip replacement surgery removes a patient’s diseased or damaged natural hip joint and replaces it with artificial hip components that “articulate,” or fit, against one another. In total hip replacement procedures, the entire hip joint—including both the socket (acetabulum) and femoral head (the curved head at the top of the thighbone that fits into the socket)—is removed and replaced by synthetic components. An alternate procedure is hip resurfacing, in which only the surfaces of the acetabulum and femoral head are revised; the “ball and cup” are made smoother and sheathed in a new synthetic surface, usually metal. Though many of the hundreds of thousands of Americans who have received artificial hip implants have reported increased mobility and a reduction in joint pain, others have had serious hip complications from poorly functioning devices. Hip replacement recalls have been issued for several implants, including the DePuy ASR hip, and the Stryker Rejuvenate model. Although hip replacement surgery has been performed since the 1940s, in recent decades an increasing variety of hip implants have been marketed to consumers, as medical device manufacturers compete for a lucrative and growing market. Though some devices appear to live up to their claims of long-term durability, others have been linked with excessively high rates of early failure, requiring revision surgery, or a second surgery to completely remove and replace the improperly functioning implant. 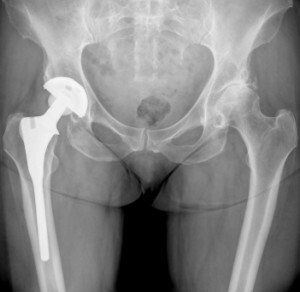 Hip revision surgery is generally considered to be more complex and riskier than the initial procedure. Metal-on-metal hip implants (devices whose parts are made of metal, usually a mixture of chromium and cobalt) have been linked with an increased risk for metal poisoning in the tissue and blood surrounding the prosthetic. Also known as metallosis, metal poisoning can cause infection, tissue decay, and pseudotumors – an inflammatory reaction resulting in a non-cancerous mass. Hip replacement recalls have been issued for specific devices in response to reports from patients and doctors about the unexpected and premature need for hip revision surgery. The Food and Drug Administration (FDA) has established the MedWatch Adverse Event reporting system to enable patients and surgeons to report any complications they experience with metal on metal hip implants, as well as other varieties of hip replacement systems. Many of the models that have been the subject of adverse event reports were not formally approved by the FDA before reaching the U.S. market, but were instead cleared for sale through a regulatory short-cut known as the “510(k)” exemption, which does not require hip manufacturers to conduct pre-market safety trials. Cleared for the U.S. market in 2005 using the 510(k) “fast track” application, the ASR (Articular Surface Replacement) Acetabular Hip System is a metal-on-metal device manufactured by DePuy Orthopaedics and marketed as lasting for 15 years or more. The ASR hip resurfacing system was never cleared for use in the U.S., though its associated parts were illegally used on an unknown number of American patients previous to the recall. The ASR XL Acetabular metal-on-metal hip device and the ASR hip resurfacing system were recalled by the manufacturer on August 24, 2010, after parent company Johnson & Johnson acknowledged that its 12-13% failure rate was higher than normal. At the time of the DePuy ASR hip replacement recall, the device had been implanted in approximately 93,000 people worldwide. According to the New York Times, the ASR device is anticipated to fail within 5 years in 40% of people, and the failure rate is expected to increase over time. Additional studies have supported these numbers, with a March 2011 study by the British Orthopaedic Association and the British Hip Society showing that the ASR failed in 21% of recipients after 4 years and in a disturbingly high 49% of patients after 6 years. The New York Times has reported that internal DePuy communications, presented as evidence in a 2013 product liability lawsuit, reveal that top company executives knew as early as 2008—two years before sales of the implant were cut off—that the ASR posed serious threats to the health of patients. Several hip replacement recalls over the last decade have involved implants manufactured by Stryker Corporation. The Stryker Rejuvenate hip implant system was approved by the FDA in 2008, and the Stryker ABG II in 2009; both were cleared for sale via the less stringent 510(k) system. Whereas many other joint implants are comprised of a one-piece neck and stem, the Rejuvenate and the ABG II offer multiple stem and modular neck arrangements, meant to provide greater flexibility in conforming to each patient’s unique bone structure. In April 2012, Stryker issued a safety communication to surgeons, hospitals and patients to alert them of potential risks with the Rejuvenate and ABG II systems. On July 6, 2012, the company implemented a voluntary Stryker hip recall for both devices, citing the potential for fretting and corrosion at the modular neck junction. A May 2012 study, funded partly by the company, found that the cobalt and chromium femoral head and stems increased the risk of adverse tissue reactions and high levels of metal ions in patients. Out of the 19 hip stems the researchers investigated, only one showed no indications of corrosion. At the time of the Stryker hip recall, over 60 reports of adverse events related to these implants had been submitted to the FDA. The FDA approved Stryker’s Trident hip replacement system in 2003, but by 2005, they had already started to receive reports of complications. In 2007, the FDA sent two separate letters to Stryker, warning them of problems—including bacterial contamination—they detected when inspecting the company’s manufacturing facilities in Ireland and Mahwah, New Jersey. On January 22, 2008, Stryker publicly announced the voluntary withdrawal of the Trident PLS and Hemispherical Acetabular Cups made in Cork, Ireland. The company did not admit to design defects, however, stating only that the withdrawn products failed to conform to design specifications. Launched in 2006, the Durom Cup hip implant manufactured by Zimmer Inc. was targeted towards younger patients with active lifestyles, promising to afford a greater range of flexibility and motion than competitor hips. In 2008, Zimmer temporarily suspended sales of the Durom Cup to investigate reports of high hip revision surgery rates connected with the device. The company resumed selling the implant three months later, arguing that no design defects were discovered, and that failure of the device was attributed to poor surgeon technique. Upon its return to the market, the Zimmer Durom Cup was re-packaged with more detailed surgical instructions. The 510(k) FDA medical device clearance protocol refers to section 510(k) of the Federal Food, Drug and Cosmetic Act. Section 510(k) obligates medical device manufacturers to notify the FDA at least 90 days in advance of the date they intend to release the product onto the market. This “premarket notification” is meant to give the FDA time to determine whether the product is “substantially equivalent” to a “predicate device,” or product that has been previously made available to consumers. Any product that reaches the U.S. market via 510(k) is technically not considered “approved” by the FDA. However, if it is deemed comparable to a predicate device in regard to various criteria—including design fundamentals, material makeup, method by which it is manufactured, and the use for which it is intended—the company is free to advertise and sell it. Most crucially, and controversially, products cleared through 510(k) are not required to undergo premarket approval. Premarket approval requires the device manufacturer to submit a formal application to the FDA, which must include the findings of pre-clinical and clinical studies carried out on the device. The FDA must determine that these studies’ findings show conclusively that the product is safe for consumers. No such studies, or findings, are necessary in regard to products entering the market through 510(k). Critics of the 510(k) clearance process contend that it provides a low-cost loophole allowing device makers to circumvent reasonable and necessary safety regulations. They further claim the definition of “substantially equivalent” is too broad, and that its “one-size-fits-all” classification system is not applicable to the intricate complexities of many kinds of medical devices, such as hip replacement systems, many of which incorporate multiple, interchangeable parts. Research published in the Archives of Internal Medicine in 2011 revealed that in the 5 years prior to the study, the majority of medical devices that had been subject to product recalls had initially been cleared for market through 510(k). Patients who have suffered harm from devices that were subsequently recalled from the market have filed lawsuits seeking compensatory damages for their injuries, as well as punitive damages against manufacturers for failing to adequately warn consumers and surgeons about the risks posed by their allegedly faulty devices. Plaintiff causes of action include failure to warn, design defect, negligence, and fraud.